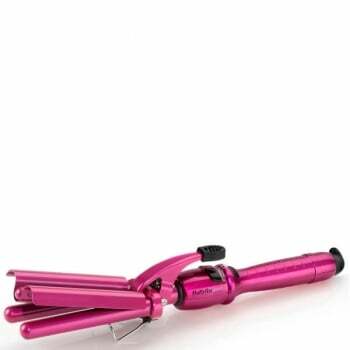 Babyliss Pro Hot Pink Triple Barrel Waver has a 25 dial a heat setting with an easy temperature control system and also a built in safety stand. Perfect for creating luscious waves, this advanced device will give you super sleek curls with a shiny finish. It comes with a professional length swivel cord to stop it from getting tangled. Ultra smooth porcelain ceramic barrel for no-snag waving. 25 Heat Settings with easy temperature control. Spring lever with rubber grip for great hair grip. Professional salon length swivel cord.